Susan Cooper (Melissa McCarthy) is an analyst working for the CIA. She's good at her job, but that job mainly consists of providing support to Bradley Fine (Jude Law), a stereotypically brilliant and dashing field agent who Susan not so secretly pines for. When a mission goes awry, Cooper volunteers to leave her desk and go after Rayna Boyanov (Rose Byrne), the one person who knows the whereabouts of a nuclear weapon which will be auctioned off to the highest bidder in a matter of days. As she travels across Europe, Cooper has to contend with hordes of assassins who are after Rayna, but also her colleague Rick Ford (Jason Statham) who has gone rogue in pursuit of the same mission. Like writer-director Paul Feig's previous film, The Heat, Spy is a slightly deceptive film. While it initially looks like a spoof of spy movies and their tropes, with Law being massively over the top (and distractingly cast as an American) and McCarthy serving to point out how much help someone would need to appear as cool and unflappable as Bradley Fine. Past the first twenty minutes, though, any lampooning of the genre is put on the back burner and Spy settles down into being a comedy that just happens to feature spies. That's the smart choice given that spy parodies have been done to death at this point, but also because it allows Feig and his cast to riff and play around in ways that are sometimes only tangentially connected to the spy genre. There's a simple joy to watching Melissa McCarthy destroy one of Rayna's security team with a litany of increasingly brutal insults which would seem out of place in a more rigorous, point-by-point deconstruction of spy movies. The closest the film gets to specific self-awareness is in its treatment of Rick Ford, who provides an opportunity for Jason Statham to play off of his relentlessly gruff and bombastic screen persona. The film doesn't have Statham do or say much that he wouldn't say in one of his serious roles (well, "serious" might be taking it too far; let's say his "not intentionally funny" roles), but by placing him in a sillier context it immediately makes him funnier. In that respect, he fulfills much the same role that Channing Tatum did in 21 Jump Street and its sequel; he basically does the same thing he does in other roles, but plays it for laughs to great effect. Statham throws himself into the role with gusto, completely committing to an image of himself as an agent who is constantly going rogue, prone to length monologues about how amazing he is, and who believes that he is somewhat more competent than he actually is. If Spy has a broader point to make, it is not about its genre but about its star. 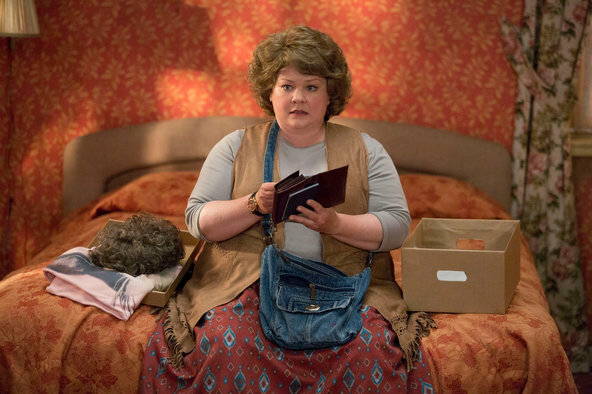 Throughout its running time, Spy feels less like a vehicle for Melissa McCarthy than a celebration of her. Not in a narcissistic or indulgent way, but in a fierce and defiant one. Beneath the espionage shenanigans (and not even that far beneath them) is a metaphor about McCarthy's abilities as an actress and the ways in which Hollywood refused to recognize them until she forced them to. As part of her mission, Cooper is given a number of identities - one might even call the roles - by the head of the C.I.A. (Allison Janney, unsurprisingly great) based solely on her appearance. In one she's a dowdy housewife, in another she's a spinster, and in both she is made to look like an asexual fool. In each case she either exceeds the expectations of her superiors, subverts them, or rejects their premise entirely. Much like Susan, McCarthy uses Spy to transcend the limitations put upon her. There are some moments when the film uses slapstick, but for the most part it avoids undercutting her competency. She beats people up, gets involved in numerous running gun battles, and outwits opponents who always underestimate her. Susan Cooper is a spy who is very good at her job, and in between trading quips with Statham, Law and Byrne, McCarthy is allowed to just be, in her own words, a badass. That's a rare thing for a woman to be in a Hollywood movie, a rarer thing for them to be in a comedy, and rarer still for them to be when they look like Melissa McCarthy. It's weird to call a film as silly as Spy empowering, but it actually is. The underlying appreciation of McCarthy manifests itself in the film's lack of fat jokes, which is refreshing, and its deep affection for its female characters, best expressed through Cooper's friendship with fellow analyst Nancy (Miranda Hart). It also serves the valuable purpose of carrying the film through its lulls. Owing partly to the loose, improvisational nature of the performances, the story isn't that propulsive (and at times doesn't seem to make a huge amount of sense), so it floats by on a general sense of good feeling and fun which is occasionally broken up by solid action sequences and moments of surprising gore. It makes for an odd mix, and one that isn't always successful, but the sense that Spy has something to say beyond the gags helps to paper over the cracks.